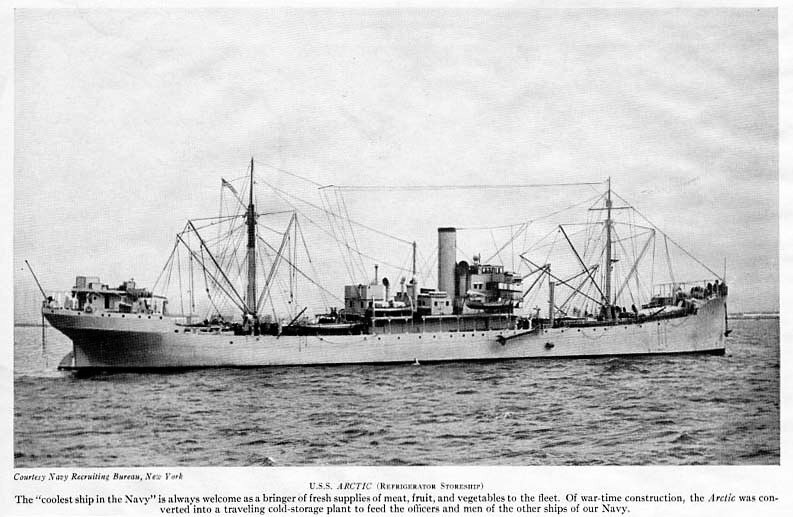 Commissioned USS Arctic (AF-7), 7 November 1921, at New York Navy Yard, New York, N.Y., LCDR. Charles H. Bullock in command. 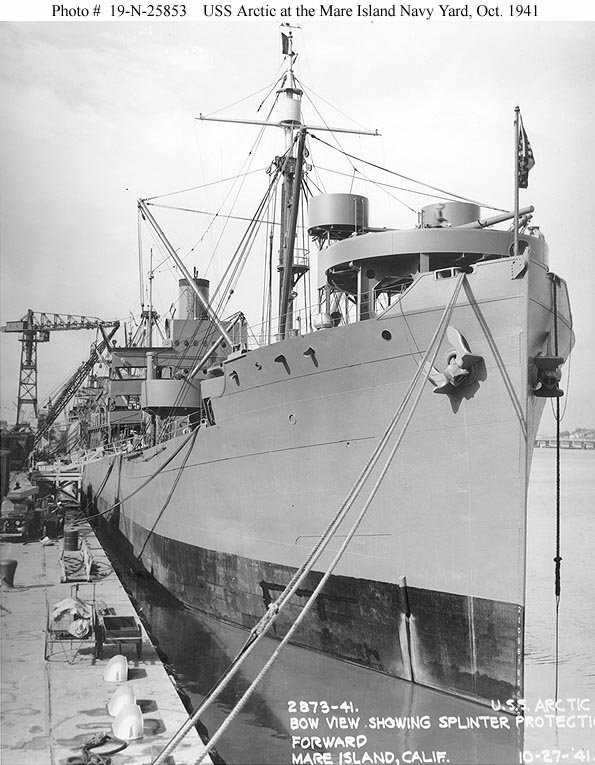 Decommissioned, 3 April 1946, at Pendleton Shipyard, New Orleans, LA. 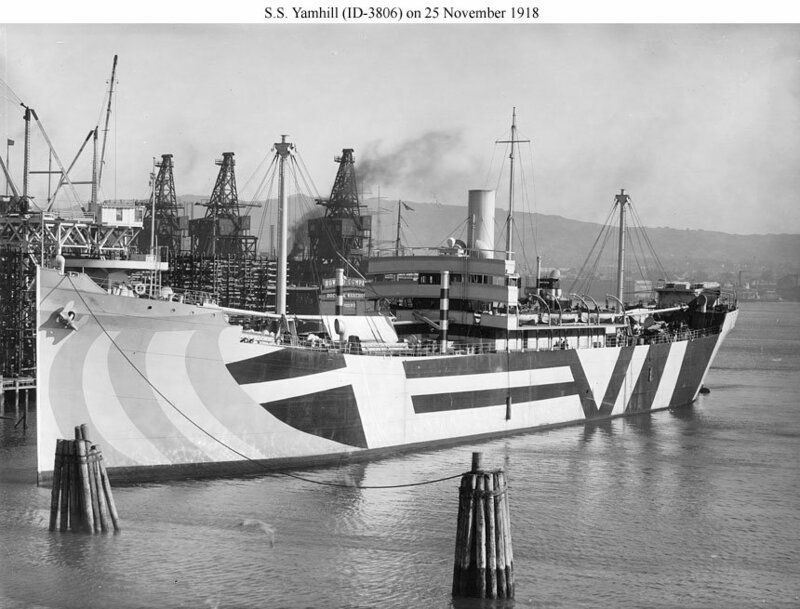 Largest Boom Capacity 7 t.
two turbo-drive 75Kw 120V D.C.
one turbo-drive 60Kw 120V D.C.
48k SS Yamhill underway in 1918, probably in San Francisco Bay, CA., during her trials. 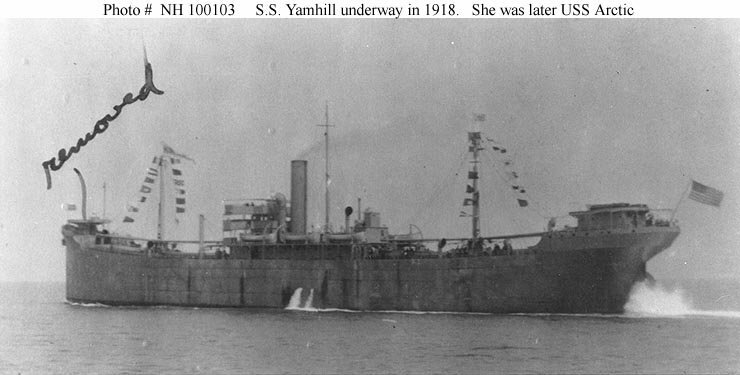 119k SS Yamhill (ID#3806) at her builders yard, 25 November 1918. 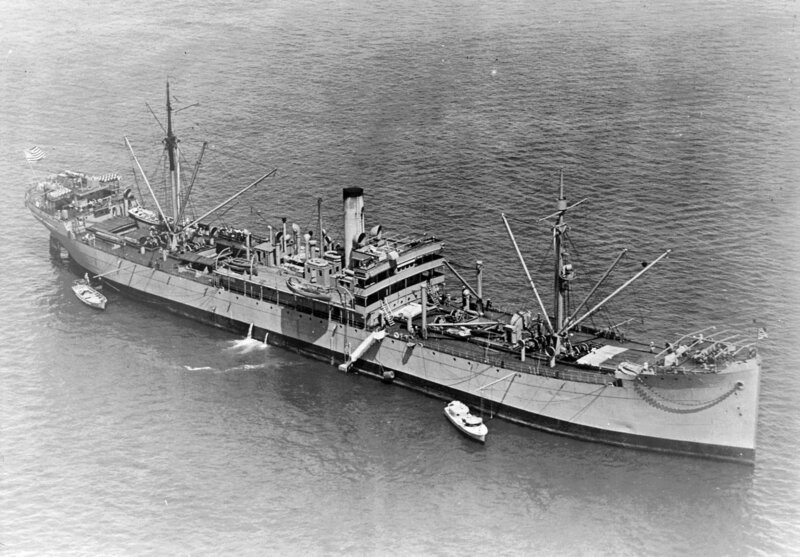 She looks complete but was not delivered until 7 February 1919. 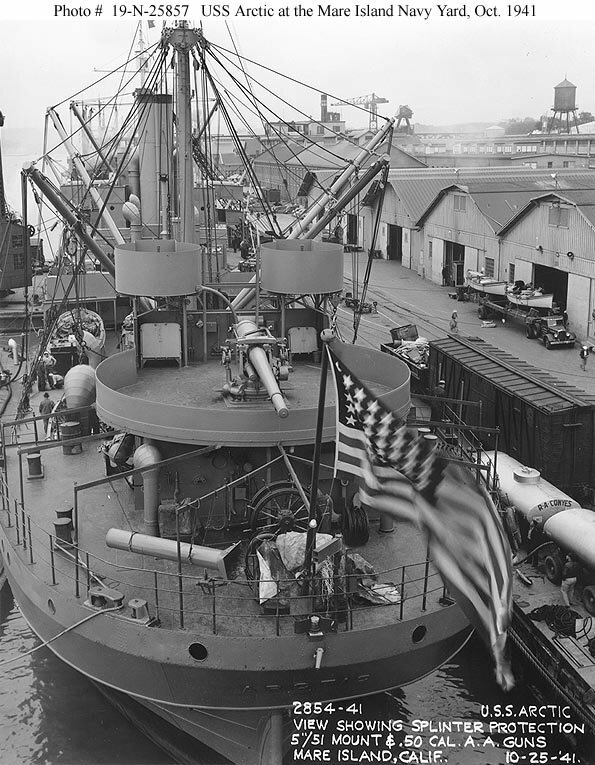 The mast near the smokestack was a wartime replacement for the topmasts on the two principal masts and, like the pattern camouflage, was intended to make it more difficult for attacking submarines to get fire control solutions. 85k USS Arctic (AF-7) at anchor in 1922, location unknown. 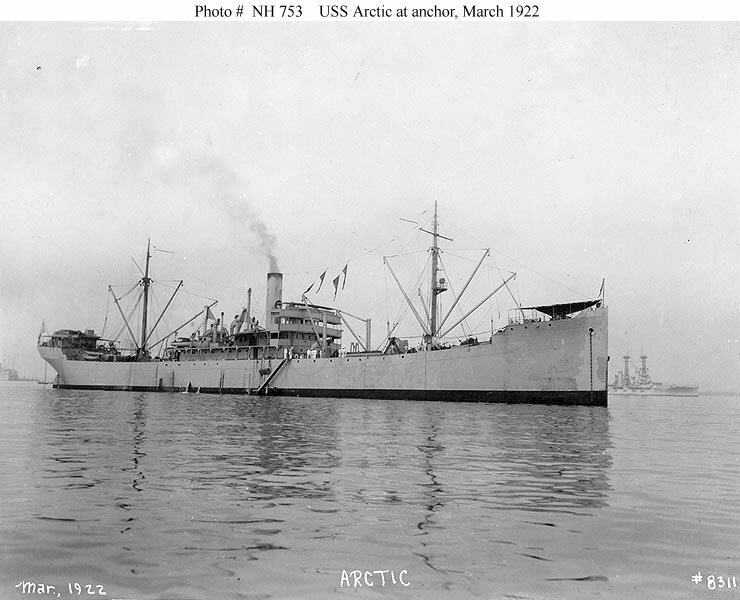 362k USS Arctic (AF-7) at anchor in 1924, location unknown. 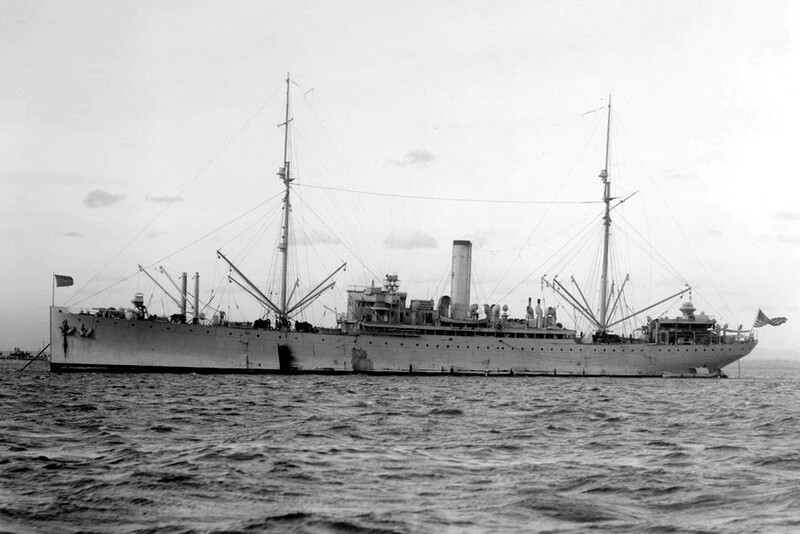 122k USS Arctic (AF-7) at anchor, Melbourne, Australia during 1925 fleet visit. 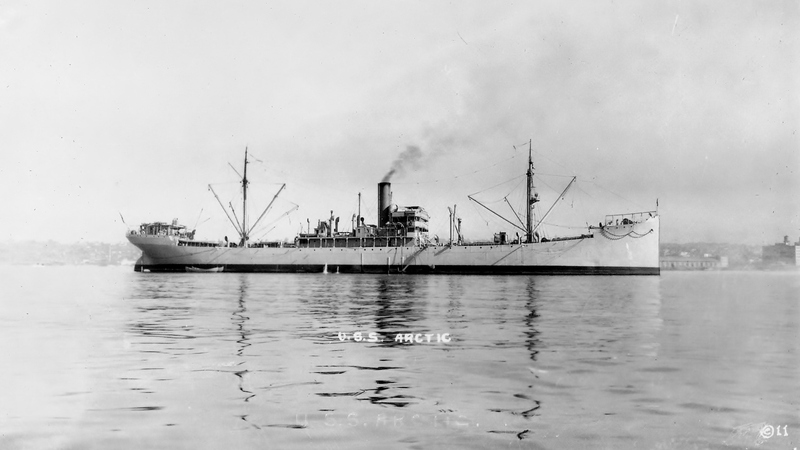 62k USS Arctic (AF-7) moored pierside, circa 1920s, location unknown. 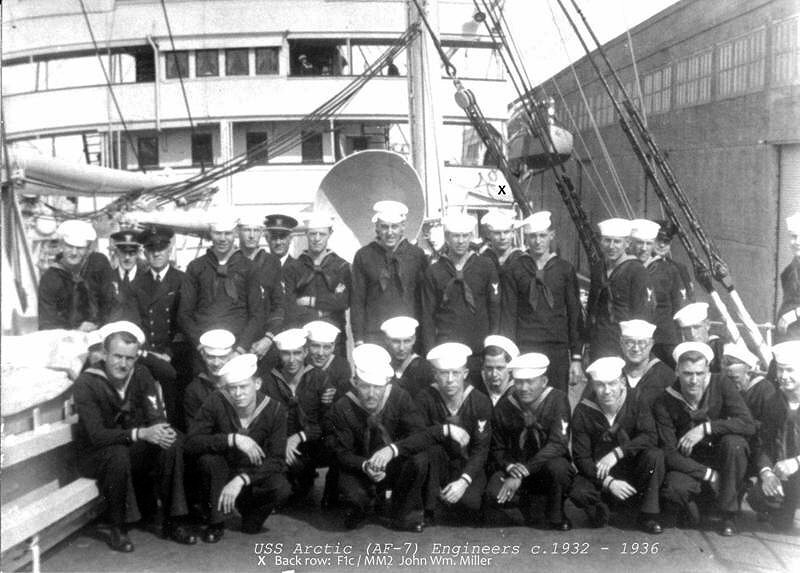 58k USS Arctic (AF-7) in harbor, location unknown, circa 1920s. 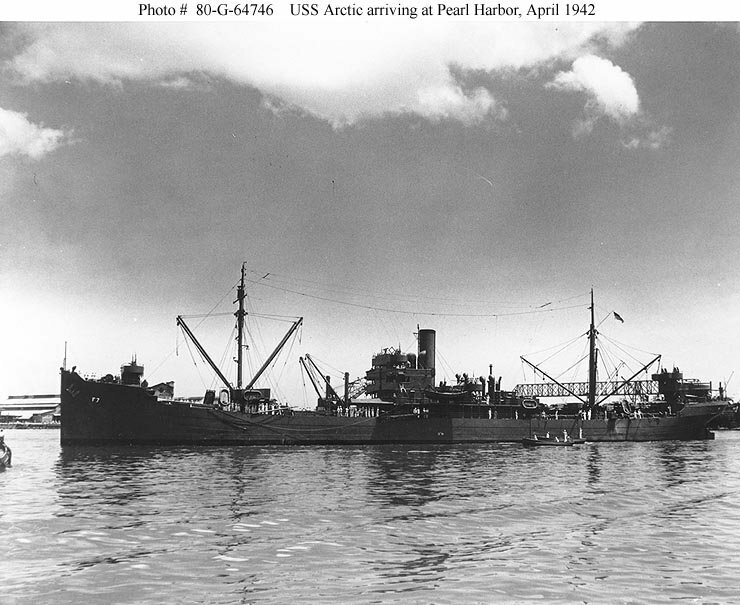 73k USS Arctic (AF-7) at anchor, March 1933, location unknown. 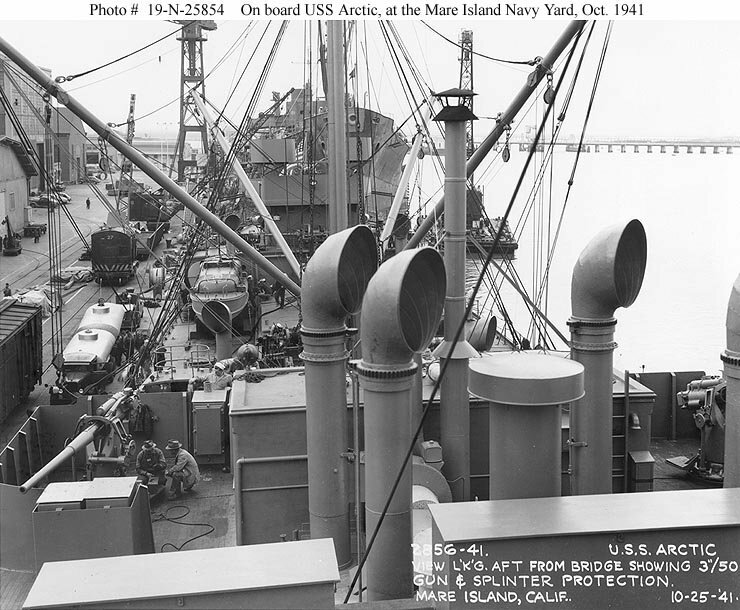 147k USS Arctic (AF-7) at the Mare Island Navy Yard, CA., 25 October 1941, view on board looking forward from the bridge, showing splinter protection recently installed around the ship's forward 3"/50 guns. 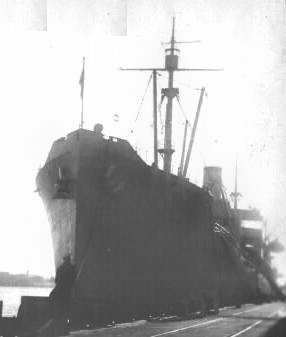 Note cargo handling booms, bell mounted on the foremast, and paravanes on deck. 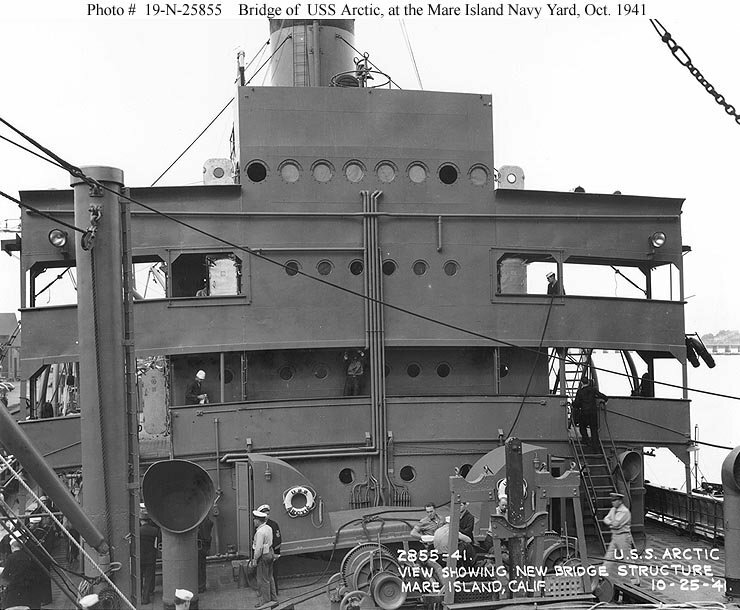 103k USS Arctic (AF-7) at the Mare Island Navy Yard, CA., 25 October 1941, view on board showing the ship's new bridge structure. Note voice tubes and life ring. 126k USS Arctic (AF-7) at the Mare Island Navy Yard, CA., 25 October 1941, view on board looking aft from the midships superstructure, showing splinter protection recently installed around her after 3"/50 guns. Note ventilation cowls. 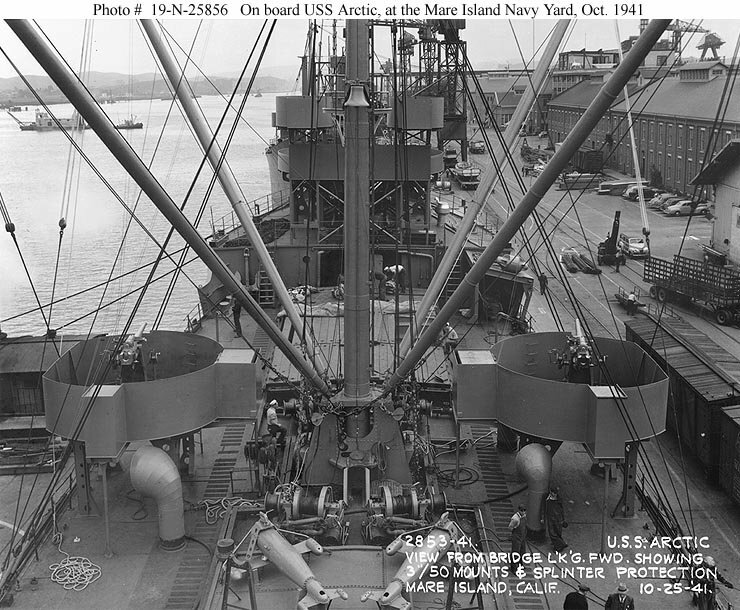 138k USS Arctic (AF-7) at the Mare Island Navy Yard, CA., 27 October 1941, showing splinter protection recently installed around her after 5"/51 and .50 caliber gun positions. 99k USS Arctic (AF-7) at the Mare Island Navy Yard, CA., 27 October 1941, showing splinter protection recently installed around her forward gun positions. 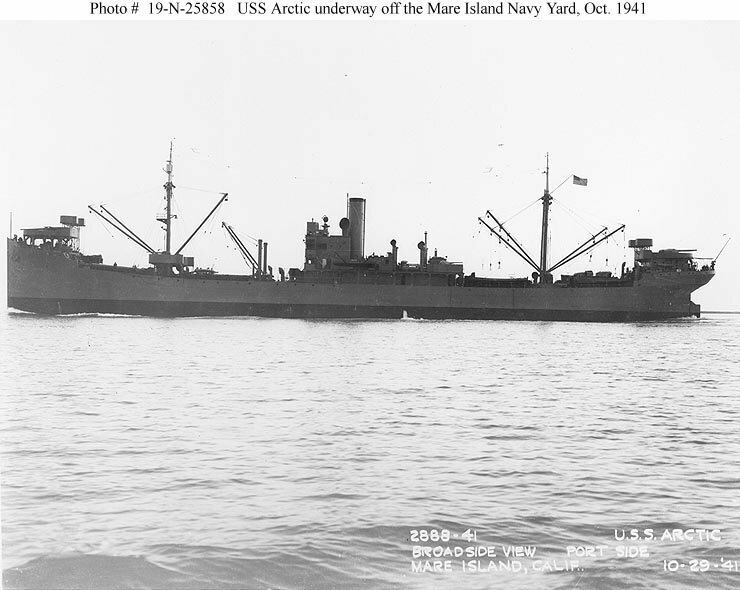 74k USS Arctic (AF-7) underway off the Mare Island Navy Yard, CA, 29 October 1941. 99k USS Arctic (AF-7) arriving deeply laden at Pearl Harbor, Hawaii, in April 1942. 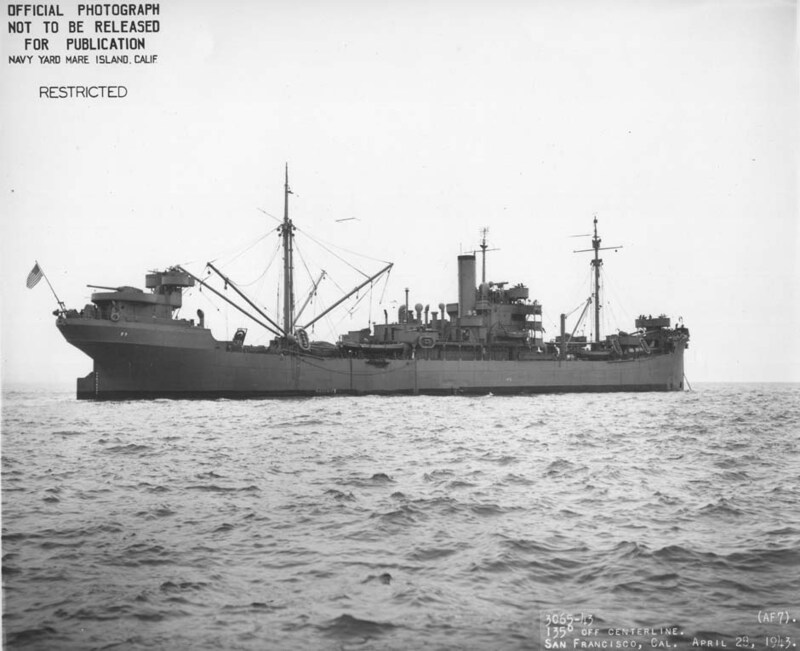 55k Broadside view of USS Arctic (AF-7) at anchor in San Francisco Bay, 28 April 1943. 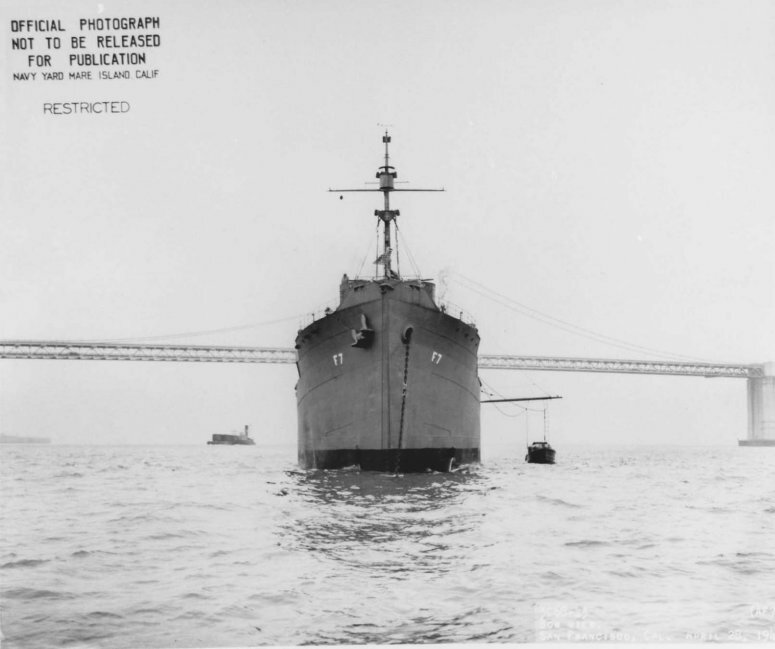 50k Bow on view of USS Arctic (AF-7) at anchor in San Francisco Bay off Naval Station Treasure Island, 28 April 1943. Note San Francisco Bay Bridge in the background. 76k USS Arctic (AF-7) at anchor in San Francisco Bay off Naval Station Treasure Island, 28 April 1943. 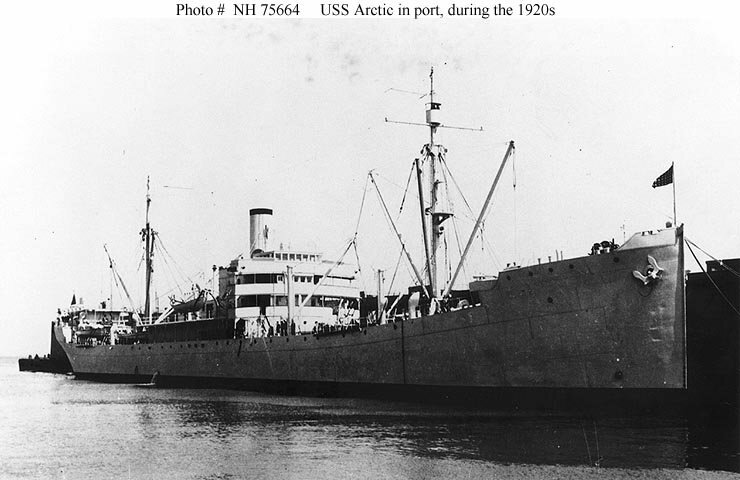 27k USS Arctic (AF-7) underway, date and location unknown. 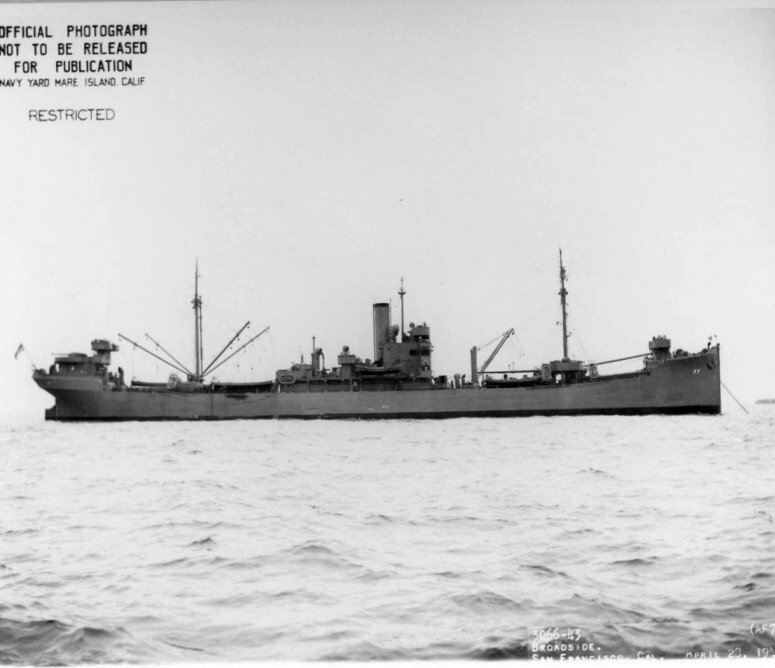 US Navy photo, 6 June 1943. Joe Radigan MACM USN Ret.